Finding Rancho Mango from El Cuco is extremely easy, just take the dirt road that goes west of town and follows the coast. 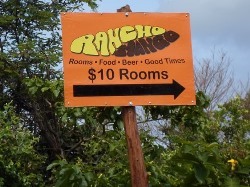 After about a half hour look for our orange "Rancho Mango" sign on the right. 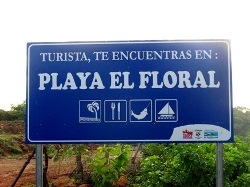 It is about 20 meters before the big blue "Playa El Floral" sign which will be on your left. Punta Mango is a scenic 2 1/2 hours from the airport. Along the way you will cross the largest river in El Salvador, pass by majestic volcanoes, see sugar cane and corn fields, travel through a quite fishing village, and feel the cool air of higher altitudes. Chartered shuttle van is the most common way for groups of 5 or more to travel. The van can carry up to 9 people and costs $100 each way for worry free transportation. The driver will be waiting at the airport for you when you arrive and will take you directly to Rancho Mango. We can include this prearranged transportation in your lodging reservation if you like. It must be arranged and paid for at least a week in advance. Taxi's can be found at the airport, prices vary depending on your negotiating skills. Some taxi's will not want to drive the 7 miles down the dirt road from "El Cuco", in which case you can negotiate a different taxi or pick-up truck to take you the rest of the way to "Punta Mango". Tell them you are going to "Agua Fria" if they are not sure where "Punta Mango" is. The price from "El Cuco" is usually $20 to $25. Rental cars can be arranged before traveling or they can be found as you exit the building at the airport. The freedom of having your own transportation can be an advantage for those who like to explore. Generally, you will not need 4-wheel drive to get to Punta Mango, but a little extra clearance is helpful so you don't drag on any rocks. It is possible that after a big rain storm the road would not be passable in a 2 wheel drive vehicle, but this generally only happens a few days a year. You can usually get a cheap rental car for about $35 a day. Be sure to print out the Driving Directions to Rancho Mango to take with you. Very few people do it but it is possible to get a boat to drop you off on the beach at Punta Mango. Its usually a better option to come by taxi from El Cuco becuase it will be cheaper and they will drop you off with your lugage on our doorstep rather than having to lug your things up from the beach. But the boat ride can be fun and the sceenery is great. The most common place to get a boat is from "Las Flores" or "El Cuco" where the trip should cost around $60.